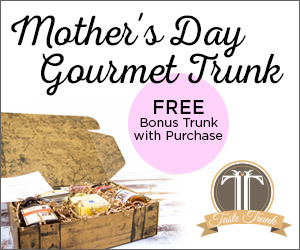 Time for a tasty little trunk of gourmet goodies! Versa Marketing is now providing affiliate program management on the Taste Trunk affiliate program in ShareASale. When it comes to discovering all of the most delicious gourmet food out there in the world, it’s hard. All the options, all of the different cultures, markets, and specialties is nothing short of overwhelming. Who has the time to be traveling around and trying all these great foods and morsels, then making them available for friends, family, and even coworkers. There are so many things to unearth, taste, and the most important, have available when you want them. Taste Trunk, a gourmet food gift and monthly subscription box company, has an amazingly delicious answer and we love every minute of it. They are bringing hand selected gourmet items from every corner of goody land and shipping a trunk of the cargo right to you, or anyone you want to share with. Finding a gift, or even just wanting to try an exotic product for yourself, is now just one delivery away. You can even choose the day you want it delivered, so it’s really perfect for the “I need this now” scenario, or any birthday, Mother’s day, weddings, etc. For foodies, this is like a little bit of heaven served on a dinner plate, but is brought right to their own two feet in a cool trunk. Let’s face it, too, buying a gift for a serious foodie is like buying grocery store white bread for an artesian baker; nothing seems to make them happy, but the best, or most unique. They don’t get jazzed unless it’s the real deal, or maybe it’s just got to be something new for it to spark an interest. All of those things are in these trunks: artesian, gourmet, unique foods that cover a pallet’s range from A-to-Z. It’s the real deal. TasteTrunk has brought us on as their new affiliate marketing agency and we couldn’t be more excited. We have been tasked with providing the best affiliate program management and growing the ShareASale program with publishers. We are totally stoked, as they say. The deal is pretty great for affiliate publishers wanting to join the program. We wanted to help grow TasteTrunk’s online sales, fast, so we have a $10.00 flat rate commission on any sale generated by an affiliate. Sales come easy, because the products in the trunks are nothing short of great. You try a little of this, taste a little of that, spread this jam and sprinkle that salt, eat a chocolate cookie here and slather some sauces there, well, it’s addicting. That’s easy to see. When it comes to cookies –– something TasteTrunk loves to pack in trunks — for affiliates, a 30-day cookie is offered to every affiliate in the channel. The long list of rotating, consistent, and great consumer promotions will run their fair share of courses, too and really help drive the traffic we want to see. The traffic that an affiliate wants to see. The kind of traffic, turned sale TasteTrunk wants to see. Short and quick, monetizing is easy. The program itself is managed by us, Versa Marketing Inc., and we really care about who is a part of the program, which is why we always give great attention to affiliates involved. TasteTrunk’s ShareASale affiliate program is up and running, and it’s growing fast. Sign up today before the Mother’s Day gift rush. This program is great for gift affiliates and subscription box affiliates and we are phyched to be the management agency on this program. For affiliates looking to make some great money, we have the program for you, with a company and product that sells itself.